Apartments Petersburg - Apartments -27, Moiki emb. Apartments : 27, Moiki emb. A renovated 1-bedroom apartment with Jacuzzi in the prime quite center of the city on Moika river embankment, 3 minutes walk from the Palace square, the Hermitage, and Nevsky avenue. The apartment features a living room 16 m², a bedroom 11m², a kitchen 14m², a bathroom 12m² and a wc room. It is located on the high ground floor. Secure entrance from the embankment is through the closed euro yard. Guarded parking lots are available 3 minutes walk from the apartment on 4, Moiki emb., over the Pevcheskiy bridge, and on the Volinskiy drive (a covered multi-story parking place). 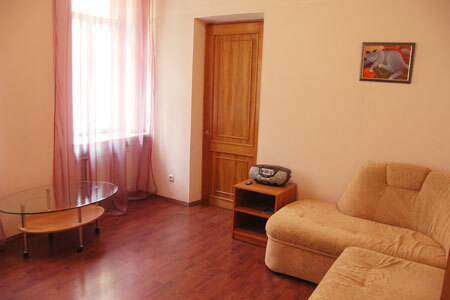 The apartment sleeps up to 4 guests (a double bed in the bedroom, and a comfortable double sofa-bed in the living room). Amenities include color television, satellite TV, DVD, Internet, CD/MP3 music player, telephone, refrigerator, stove, microwave oven, washing machine, dishwasher, hair dryer and kitchen utensils. The apartment has linens, towels, bath amenities and cleaning supplies. ©2013 Apartments Petersburg. All rights reserved.